Origin bifold door suppliers and how they work. If you are researching Origin bifold door suppliers, you will come across many different home improvement companies all over the UK selling Origin bifolding doors and windows. In this article, we give some insight into how Origin bifold door suppliers work with Origin and how both homeowners and Origin dealers benefit. How do Origin bifold door suppliers work? Some Origin bifold door suppliers are set up to only sell Origin products. Others choose Origin alongside their other aluminium and PVCu home improvement products. Whether you are looking to buy an Origin bifold door, entrance door or window from an exclusive Origin supplier or one that sells other products, there are many reasons why home improvement companies of all types, want to sell Origin doors and windows. Origin is one of the best known brands of windows and doors. Many aluminium systems companies leave the selling of their brand to their manufacturers. Others choose not to market their brand to the homeowner at all, choosing instead to concentrate on the architectural specification and commercial market that they consider more lucrative. Origin from the outset has successfully marketed their products directly to the homeowner. Origin has a slick, focused marketing strategy that has been largely responsible for their tremendous success as a company and why so many homeowners are now aware of their products even before they start their journey to buy new bifolding doors or windows. Origin is arguably now the best-known brand of aluminium windows and doors in the UK today. Origin bifold door suppliers benefit from working with Origin. In the key areas of supply, lead times, marketing and product support, Origin dealers get a service that few other systems companies can match. Visit any Origin showroom and the presentation of Origin products through physical doors and windows, marketing material, accessories and personalisation of an Origin door or window is hard to beat. When you walk into an Origin showroom the branding is prominent. The support Origin gives to their dealers enhances the homeowner experience from start to finish. Look at any other good aluminium system such as Schuco, AluK, Smart Systems, SAPA and more and you will not find anywhere near the branding to support these products or the companies that sell them. Origin, their products, their marketing and their dealer network create a professional, quality brand from start to finish. Origin is also transparent in allowing homeowners to visit their own Warrington and High Wycombe showrooms, with a substantial range of windows and doors installed in real-world environments, demonstrating today’s homeowner tastes and lifestyles and architectural trends for which Origin products are perfectly suited. The new Origin High Wycombe showroom in particular, features the entire Origin Home range, including bifolding, residential and garage doors and windows. Also being showcased is the soon-to-be-launched Origin Inline Slider. Origin products are transparent in where they come from. The home improvement industry for doors and windows is vast with many different manufacturers and suppliers. Many home improvement companies that do not manufacture, such as a typical Origin dealer, will frequently not divulge where they buy their doors and windows from. Some will of course, but the majority choose not to tell the homeowner who makes their windows and doors. The reasons for this are many, but often it is to avoid you knowing what product you are buying and seeking to deal directly with the manufacturer, in an effort to save money by dealing direct. As we explain later, the Origin manufacturing facility, their processes and how you get your Origin doors are arguably one of the best in the window and door industry. In buying Origin doors and windows you will find a lot more transparency as to who makes your windows and doors, compared to many other systems. The Origin route to supplying their dealers is also far more transparent. And, unlike other systems companies, there is a clear willingness to communicate directly with the consumer on behalf of and to support Origin bifold door suppliers. Understanding how Origin doors are supplied to homeowners. The processes Origin has in place throughout their operation are designed to give homeowners and their dealers the best in service and customer experience. Origin windows and doors are renowned for the high quality of manufacturing with some of the best paint finishes, components and assembly methods available. Origin has the best lead times in the door and window industry for the fast manufacturing of their doors and windows. Origin lead times are based on an understanding that many home improvement projects today involve the building of new extensions, often needing a speedy installation of windows and doors. Origin doors and windows are provided fully protected to prevent damage on construction sites. Even where Origin does not use their own suppliers, any external suppliers are renowned for their quality and reputation. Examples include external powder coaters for non-standard colours, door hardware, bifolding door blinds and glass in their new Inline sliding doors. Origin bifold door suppliers all work within the slick Origin framework meaning that from the initial enquiry to the homeowner having their doors fitted in their homes, Origin has played a part, even though the customer contract is with the dealer and not with Origin directly. The Origin method of working, how they move their products to their dealers benefits both the Origin dealer and the homeowner. The Origin dealer benefits from a service designed to provide quality bifolding doors fast, without delays and with consistent quality. The homeowner benefits from knowing just what is behind their new Origin doors and why they come with a 20-year warranty. Buyers of Origin doors and windows have the peace of mind that their installers are trained, approved and reputable as well. Origin supports its Dealers through ongoing training, support, product development and the fastest delivery times. Training and quality products, coupled with a marketing programme designed to ensure their doors are in high demand and desirable ensures both dealers and homeowners benefit from Origin bifolding doors and windows. 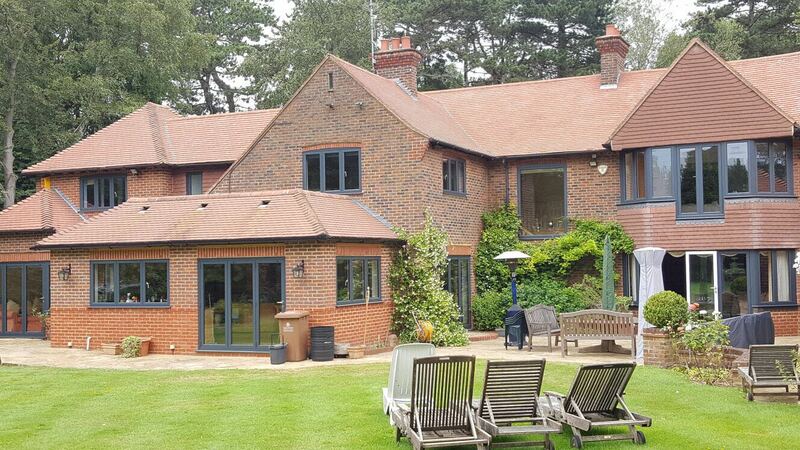 Our main image features Origin windows, doors and bifolding doors, made by Origin, supplied and fitted by UK Windows Surrey.